A couple of months ago I sold an image file of my Sydney Opera House and Circular Quay Panorama to be used for an 8 meter wide display at the opening exhibition at the new Utzon Center in Aalborg, Denmark. The building is of course designed by the Danish Architect Jørn Utzon, famous for designing The Sydney Opera House. Last weekend I finally had a chance to visit the Utzon Center and see the print at the exhibition. It’s a very impressive building and wauv; the photographer who shot that 8 meter wide photo, he’s really something special, he’s a legend !!! Well I doubt that my dear 2 year old nephew (who loves the camera!) will be there as he is in this shot, but get to the Utzon Center before 10th of September 2008 and the print will be there! Here’s a link to video of the photo (shot with my old crappy camera phone, sorry about the appalling quality). I was actually going to ask them what they planned to do with the print after the exhibition but after seeing how it’s mounted it wouldn’t really fit in my flat! I tell ya it’s not easy getting any photography done with all these UEFA EURO 2008 footy matches on every night! Nothing can stop me though when the light looks to be special and after having sunshine, rain and hail storms visit us during Monday I knew it would not be dull. I used my 17-40mm wide angle lens, but did end up using one of tighter shots at 40mm as the composition was better. I shot at f/22.0, iso50 and used a neutral density filter to cut light and be able to expose for 6 seconds maximizing colours and light. I am standing on top of the bridge (it’s more like a road that crosses the lake) “Fredensbro” and it was blowing a gale as the water demonstrates! When shooting a scene like this be very careful with the red channel, it is very easy to blow out if you just measure luminance. The Canon 5D displays an RGB histogram but if don’t have that then measure the light on the clouds and underexpose by a stop and bracket your exposure. The red channel will be at least a stop brighter than the other channels. The compressed 8bit jpeg above actually has a bit of blown red, but the original doesn’t. Blown reds are ugly, avoid them like the plague! The clouds and colours on this evening were from another place. These are clouds on fire, tropical colours that really do not belong in cold Scandinavia and it was a mesmerizing light show. Clouds for dreamers. With my head in the clouds. Trying not to fall over. It’s off-topic day, not about my photography for a change! I live, eat and breathe photography but also love writing and I write a lot when I travel. As I get ready to embark on another photo trip to Australia the travel bug gets me. I long for travel, long for doing photography all the time every day in new locations every day in an alien yet familiar outback landscape on the other side of the world. Eternal Restlessness. The closer I get to travelling the more travel novels I read. I am somewhat strangely obsessed with everything Bruce Chatwin at the moment after having re-read his novel Songlines twice in one week. I forgot what a masterpiece of literature that book is and how good a writer he was. Also quite a fascinating character! I am presently reading the biography and a few of his other novels. I love writing while travelling. I do write at other times but nowhere near as much. The first few times I travelled abroad I wrote in classic diary style, “I did this, I went there, I saw that” etc. Mind-numbingly boring to read now! But the last many notebooks are written travel story style with a mix of thoughts, reflections, observations, history, humour and anecdotes. Trying to put the reader inside my head (scary place!) Still boring probably but at least somewhat different! 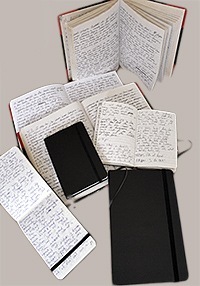 I now write in the gorgeous Moleskine notebooks of course, the sure sign of someone desperately trying to be creative. I’m no Bruce Chatwin but hey, I use the same notebooks he did! On the right is a photo of the travel notebooks I have written so far. After I began blogging not only do the notebooks have to suffer my words but so do the internet as my Travelog page demonstrates! Who knows, some of my old stories buried in the notebooks on the right might make it online someday. Or someday when my photography makes me rich and famous I can publish these! Maybe not, I reckon I should stick to photography! Moleskine. It’s pronounced Mol-e-skin-a if you feel like attempting some Italian (the company is Italian). Just when you thought it was safe to go back in the water…or back in the outback at least…I am back! On 27th of August I once again depart to rendez-vous with my soul in my second home, the country of Upside-Downers – Australia. I will spend about a month in “godsown” this time concentrating my shooting in the Kimberleys area in Western Australia where I’ll roam the outback for a bit more than two weeks. I will also revisit Hawk Dreaming in Kakadu National and then end up with a few days of visiting mates in Sydney. I may end up going to Broken Hill as well, presently contemplating this idea. I cannot wait to re-visit the glorious outback in the Kimberleys. I have explored the area once back in 1998 (in the wet season no less but with no rain, just 52c degree sunny days!). This was before I was really into photography and only armed with an old Canon EOS 1000 SLR with one lens and some Fujichrome (and Aerogard for the mossies!). This time I will be armed to the teeth with a tonnes of Digital SLR gear! I have always wanted to go back and shoot here again because it is such a special place. Here is my 1998 version of the famous Gibb River Road in the Kimberleys, a scan of an old worn down slide. 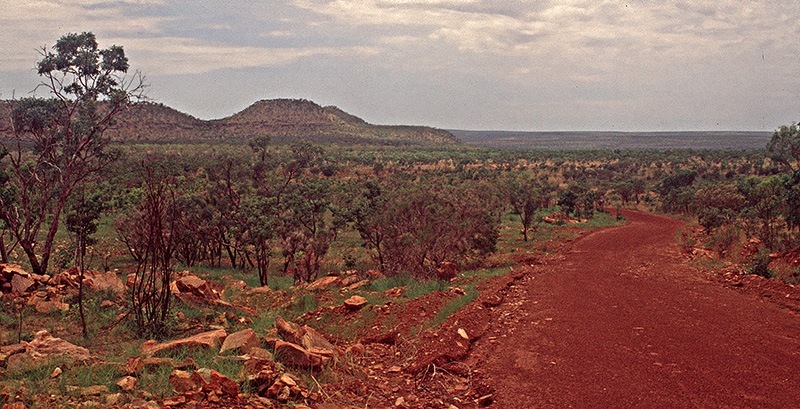 Gibb River Road in the Kimberleys. See ya soon all you upside-downers down under! I received a lot of feedback on my Hawk Dreaming post and I’m grateful you liked the story and my writing. I do like writing although I’m a terribly ordinary writer (actually that’s an insult to ordinary writers) but hey, words are cheap on a free blog! Click my Travelog link if you’re bored out of your mind and can’t think of anything better to read! As a follow up to my Hawk Dreaming story from a few weeks ago, here’s a photo file that I recently dug out of the archives and processed. It is the very last rays of sunlight at Hawk Dreaming lighting up parts of Cannon Rock and I used my Wacom tablet and painting with light in photoshop to subtly enhance the light. I made the rocks glow a little bit extra and I darkened the grass slightly. I particularly like the long narrow cloud above the rocks, a perfect painterly composition. Imagine sitting here at the end of a very warm day in tropical Kakadu National Park. It’s just you and Nature. No civilisation visible anywhere (ehm, apart from all your camera gear and the 4WD). Time does not exist. The sun sets very quickly and the light changes from hard, glaring and bald to soft, warm and subtle. The wind settles down in time with the sun and there is suddenly not a single sound in the world and Time seems frozen for a brief moment as the sun sets. A new world awakens as the sun disappears and the sound of nocturnal creatures come alive. The last remaining evidence of daylight in the sky are captured on camera until total darkness signals the end of today’s awe-inspiring show by Nature. You realise you haven’t said a word for 30 minutes and can’t recall breathing. You wish this would last forever. This is why I shoot landscapes. Well, I told you the photo is better than my words. Oh and one of the nocturnal creatures coming alive – mosquitoes! So do remember some strong repellant like Bushman or you will be eaten alive and become a permanent part of Nature! One of the disadvantages of going through unprocessed RAW files is that it’s possible to miss some excellent but not so obvious shots. Just like in the traditional darkroom days you have to visualize the end result (Ansel Adams talked a lot about this) because an unprocessed RAW file can look rather dull. So sometimes I end up picking the obvious shots and miss the subtle but better shots like the one above. That is one reason why I never delete a single RAW file from my travel photography. They’re a bit harder to re-shoot than say a photo from my home city of Copenhagen. Like good music it’s the albums which are less obvious that’s usually the classics in the long run. Obvious becomes tiring quickly because it’s … obvious. So I love going through old RAW files because with fresh eyes I’m sure to spot some yet to be discovered subtle gems!